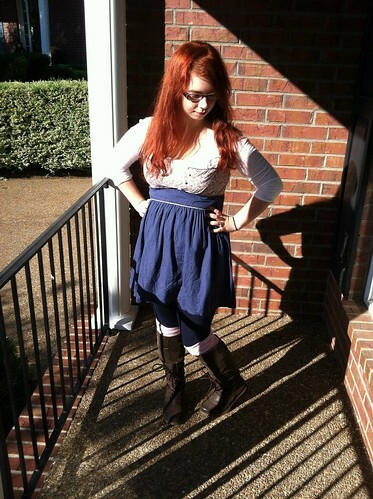 So you can’t see a lot of details of my outfit because the sun is stupid and I am a terrible photographer, but who cares because Ariel hair! My sister’s best friend is in beauty school, so she came over to cut and color our hair. I hadn’t dyed my hair since August (and it had turned out the wrong color anyway) and it hadn’t been cut since April, so it definitely needed a little love! I am so thrilled with the color, and my students kept exclaiming over how pretty it looks. I love this dress, but it’s one of the perils of buying thrifted clothing online- it was listed as a large when it’s a small! So I have to leave it unbuttoned. But hey, still, cute, right? Right? Oh well. Also my knee socks were a dollar at the end-of-winter sales at Claire’s, and they’re sparkly. AWESOME. It was a great outfit for a long, long day. My friend Meg was in town from Pennsylvania, so we went out for breakfast before I took her to the airport. And then it was my first day back at school after fall break, so my kids did NOT want to do anything and I didn’t really push it. They have a paper due tomorrow for me, and only one of them turned it in! Silly children. And then I had three-hour Narnia rehearsal, where I still had four main actors missing. And then I had Emanate. So long day, but really good!